Susan Kobe, 86, died on Thursday, April 5, 2007, at the Blaine Manor in Hailey. Rosary and Vigil will be at 7:00 p.m. Friday, April 13, at the Wood River Chapel in Hailey. Funeral Mass will be at 9 a.m. Saturday, April 14, at the St. Charles Catholic Church in Hailey. Urn interment will be in the Hailey Cemetery following the Mass. Susan was born April 24, 1920, in Red Lodge, Mont., the daughter of Daniel and Catherine Flood Rooney. She graduated from Leadore High School in Leadore, Idaho. She first married Jim Douglas, and after that marriage ended, she married John Kobe. Susan was a waitress at the Western Café in Ketchum, a bartender at the Casino in Ketchum and the Mint in Hailey. She also worked for a time as a telephone operator. Her favorite things to do included crocheting blankets and spoiling her grandchildren and great grandchildren. She was what held the family together. She moved to Gooding, Idaho, when her grandchild, Michael, who has cerebral palsy, attended the Idaho School for the Deaf and Blind, and would not let him live in Gooding alone. She lived for her grandchildren, great grandchildren, sisters, brothers, nieces and nephews. She was the home-base for the whole family, which stretched all over the U. S. For the last 20 years she made her life of taking care of grand kids and great grand kids. 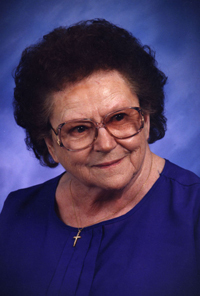 Susan was member of St. Charles Catholic Church and the American Legion Auxiliary. Surviving family members include her son Michael (Ann VanEvery) Douglas, of Bellevue; her grandson Michael Douglas, of Bellevue; her granddaughter Brenda Douglas and great grandchildren Vanessa and Gabriel Douglas, all of Hailey; granddaughter Sonya VanEvery, granddaughter Elizabeth Fair and great grandchildren Eisham and Mishantia Fair, and grandson Zachary Hankins, all of Nampa; her sisters Cecelia Stone, of Hailey and Tonopah, Nev., and Terry Howes,of Hailey; and numerous nieces and nephews. Susan was preceded in death by her husband John, her parents, and eight brothers and sisters. The family suggests that those wishing to make a donation in memory of Susan Kobe direct their gifts to either the Blaine Manor of Hailey, or the American Legion-David Ketchum Post 115 of Ketchum. Arrangements are under the care of Wood River Chapel of Hailey.